On a hot and humid evening this May, a middle-aged man clad in shalwar kameez is standing in front of a group of people who are seated on the ground. He is leading a recitation of hymns from the Bible. He first reads out a verse and then explains its significance before others join him in a rhythmic recitation of it to the accompaniment of a dhol. The assembly is taking place at 10 pm in a dimly-lit street in Youhanabad, a low-income, Christian-majority settlement in Karachi. 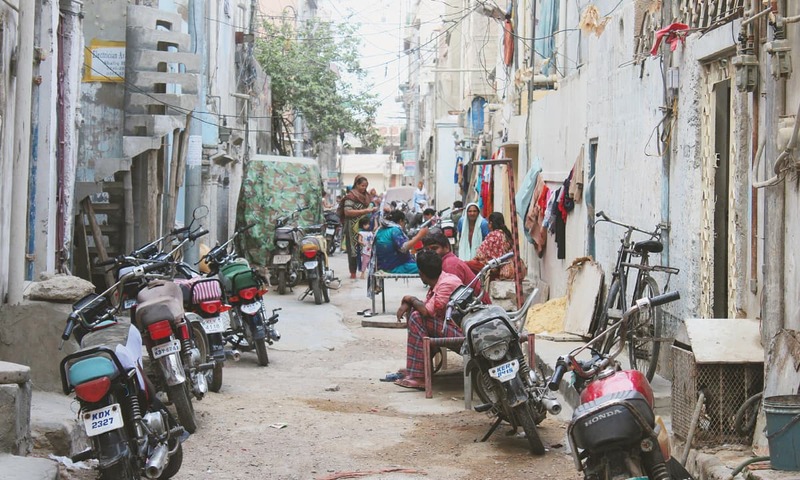 This neighbourhood, wedged between the Lyari Expressway and Gulshan-e-Iqbal area, comprises 50 houses and is located on a small strip of land criss-crossed by narrow streets. The recitation has become a regular feature of life in Youhanabad in recent times. Local residents believe it will provide them with divine protection from those who have stormed the area in the dead of the night multiple times since March this year. The raiders come in vehicles that have no number plates, break into various houses and take away young men who are later nominated in different criminal cases. Khurram Shahzad, 30, was picked up from his house in Youhanabad in the same manner. His house was raided at dawn on May 8. Some of the raiders were in police uniforms; others wore black commando t-shirts; still others were in civilian clothes. After a thorough search of his house, they took him into custody. The same action was repeated at least at a dozen other houses. Shahzad, a young man with a muscular built and neatly trimmed hair, says he and others picked up along with him that morning were taken to an unknown location. “They kept all of us in a room which did not look like a police station. They tortured us and pressured us into accepting that we were involved in street crimes,” he says. After seven days of continuous torture, he alleges, all the men in custody confessed to having committed various street crimes. A First Information Report (FIR), registered at Karachi’s Shershah Police Station on May 15 and numbered 96/18, states that Shahzad and Kashif Robin, also held in detention alongside him, possessed illegal weapons – two 30-bore pistols and four loaded magazines – that police recovered from them during a patrol near Lyari Expressway at 2 pm on May 15. Others were nominated in various street crime cases in FIRs registered at different police stations in Karachi’s District West (whereas Youhanabad falls under the jurisdiction of Karachi East). A few days later, Shahzad and Robin were produced at a district and sessions court which ordered their release on bail — provided they could deposit 50,000 rupees each as security. Shahzad’s younger brother, who works for a courier company, paid the money to have him released. Kaleem Maseeh, 32, was also among the 14 people taken into custody on May 8. “Had we not opened the door for a few more minutes, they would have stormed through it,” his mother Zareena recalls the events of that morning. According to her, four or five raiders came into her house with a young man whose face was covered with a black cloth. He was a local resident with a criminal record and was working as an informer for the raiders, Zareena alleges. “They turned our house upside down,” she says, and took her son Kaleem and son-in-law Faisal outside, beat them up and whisked them away. Kaleem was working as a delivery boy for a pizza joint and, at 32 years of age, was the eldest among those arrested that day. The rest were aged between 15 and 30. He was later nominated for a mugging in an FIR also registered at Shershah Police Station and says his family paid 50,000 rupees for his bail. Both Kaleem and Shahzad have now lost their jobs for being absent from work during their detention. Armed men wearing black t-shirts knocked hard at the door of Shafqat Bibi’s house in Youhanabad on April 15, 2018. When the door did not open, they broke its latch and got in. They were looking for her 20-year-old son, Sadim Qamar, but he had not yet returned home from his job at an eatery. They stayed in the house for half an hour, waiting for Qamar. When he did not turn up, they left but not without warning her that that they will “come back and take him away”. Since then, her son has moved out to another place to avoid arrest but his family is still “scared that they will come after him”. Sitting in the corner of a room in her small house, 50-something Shafqat Bibi says the raid shook her family so much that they are scared to even talk about it. Fear, indeed, engulfs Youhanabad even though all, except one, of the 24 local men picked up in three different raids between March and May this year have come back home. Local residents are wary of strangers even weeks after the raids. Nadeem John, a middle-aged community activist in the neighbourhood, cautiously looks around on a July afternoon in order to ensure that he is not being overheard by any suspicious looking outsider. “Every now and then, people and vehicles not belonging to our streets are seen here,” he says. Just two weeks ago, he says, the raiders paid another visit to the neighbourhood – this time in a black double-cabin vehicle and some police vans at around 3 am – though they neither picked up anyone nor broke into any house. “We have not regained our peace of mind yet. Our women remain awake at night and keep a watch on the streets,” he says. John claims most of the men arrested from Youhanabad were doing their jobs regularly and came back home from work as per a normal routine. There was nothing in their demeamour to suggest that they were involved in criminal activities, he claims. Some local residents gathered around him nod in agreement. In late May 2018, the Sindh chapter of the Human Rights Commission of Pakistan (HRCP) constituted a fact-finding committee to probe the detentions from Youhanabad. The committee interviewed several families in the neighbourhood as well as the police concerned and issued a report which quotes some police officers claiming that they did not have any knowledge of any raids in Youhanabad. The report points out several discrepancies — the most glaring of them being that the six men taken into custody on April 15 are shown in FIRs to have been arrested on April 20 and the arrest of 14 men picked up on May 8 is recorded by the police to have taken place on May 15. There are two widely divergent explanations for this: residents of Youhanabad say the men picked up from the neighbourhood were kept in illegal confinement by some security agency for several days before they were handed over to the police; the police, on the other hand, claim those men were all arrested during routine patrols in various areas of the city. The report tries to resolve the discrepancy by quoting “two [police] officers of District West” who, on the condition of anonymity, “told the HRCP team that this activity (in Youhanabad) was carried out by the Intelligence Bureau (IB) and the men who were picked up were given to different police stations after some days, where FIRs were registered on them.” The report does not include any evidence to substantiate this claim though the IB is yet to issue an official denial of it. Omar Shahid Hamid, who at the time of the raids was working as Senior Superintendent of Police in Karachi West, the highest police post in that district, says the Youhanabad men were arrested because they were involved in street crimes, but he denies the police under him conducted any raids inside the neighbourhood. The writer is a multimedia producer at Dawn.com. This article was published in the Herald's August 2018 issue. To read more subscribe to the Herald in print. What's happening in the land of pure? S Mazari, any comment, please.